The problem with a lot of beautiful national parks in mountain landscapes is that they lie in mountain landscapes. The rugged terrain is subject to landslides, and my favorite nearby park, Yosemite, is no exception. 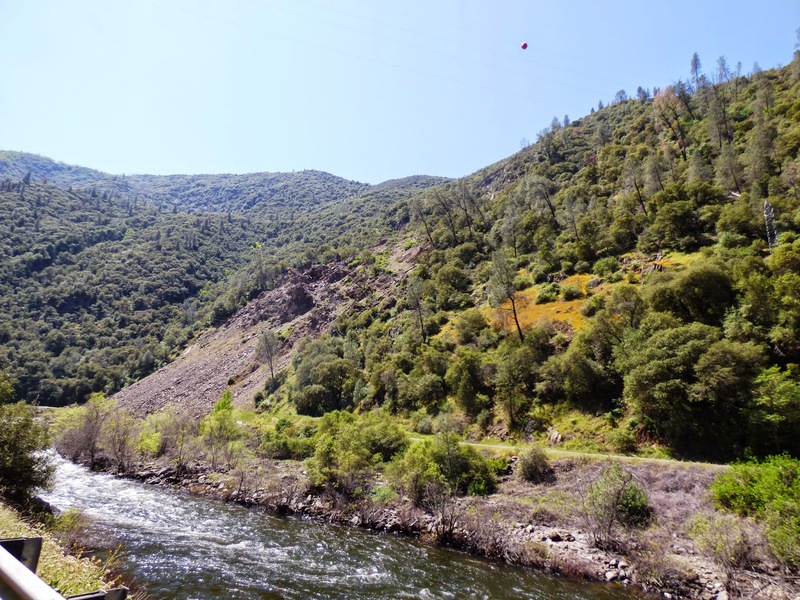 The park has four entrances, but only one can be considered an "all weather" access point, as it follows the Merced River, and does not have to surmount any snow-covered passes. Highway 140 may be the lower route, but it is not without its problems. The Merced Canyon downstream of Yosemite Valley is rugged and steep, some 2,000 feet deep in places. 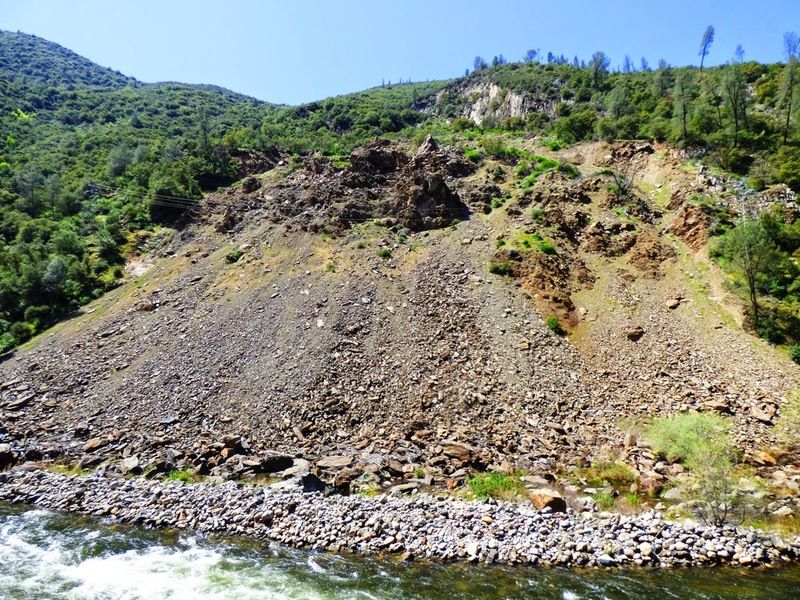 Instead of granitic rock, it carves through the metamorphic rocks of the Mother Lode, including the sometimes unstable slate, phyllite and chert of the Calaveras Complex. There was a prehistoric slide near Savage's Trading Post. 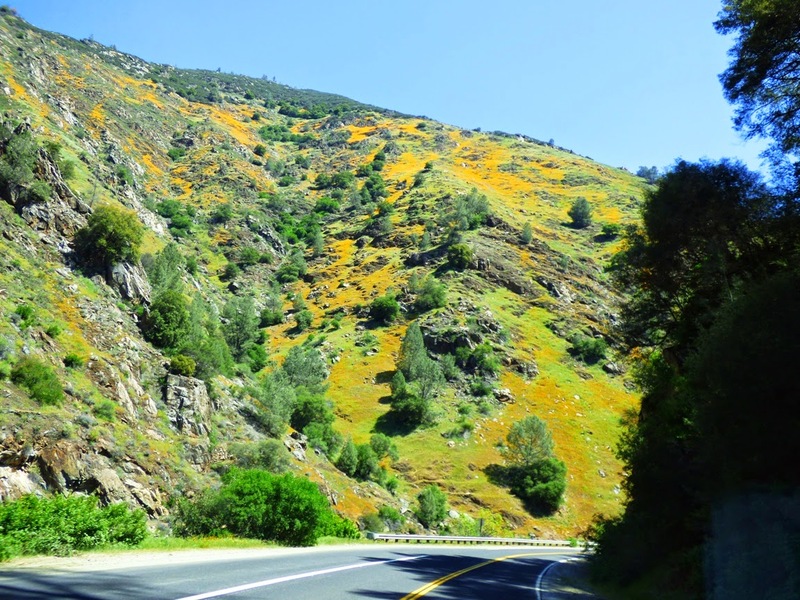 The so-called Ferguson Slide had caused problems in the past, and Caltrans had been looking to stabilize it, but in 2006 it overwhelmed the mitigation efforts and gave way, covering 600 feet of Highway 140 with hundreds of thousands of tons of metamorphic rock. The highway was totally blocked, and there were serious fears that the slide could completely block the river valley and flood the small village upstream. Local communities, especially Mariposa, were devastated by the Ferguson Slide. Tourism makes up a huge portion of their economy, and with the highway closed, no one was coming through town. The first temporary fix, two quickly built bridges that detoured around the slide, were impassable to buses. Mariposa continued to suffer economic losses, so by 2008 the bridges were realigned. At present there are are delays of up to 15 minutes waiting for traffic to pass the one-way road. I missed the story at first in the newspaper last week ("newspaper": a form of information transfer that predates the internet), but work has begun on a "permanent" fix on the section of Highway 140 beneath the slide. The first part will involve the removal of more than 100,000 cubic yards of slide debris, followed by the construction of a 750-foot "rock shed" that will channel future debris slides over and across the highway. I've seen snow sheds before on many alpine passes, but this will be only the second rock shed in the country according to Caltrans. The project will cost $133 million and will be completed in fall 2019. The work is not expected to block traffic, as the "temporary" detour will remain open. I understand that the rock shed approach will be one of the least environmentally intrusive approaches to mitigating the slide (assuming it's done right), but I'm struck by the fact that this one road repair will be only slightly less expensive than the complete renovation of Yosemite's infrastructure following the devastating floods of 1997 ($182 million in 1997 dollars). And it's been nearly twenty years since those renovations, and Congress has never been one to keep up with the care of our national parks. It would be nice if we could take care of our parks as well as we care for the access to those parks. In any case, this is a good time to be visiting Yosemite via Highway 140. Despite the drought years, the spacing of the few rainstorms we've had has left a lot of greenery along the river corridor. I haven't been up there yet to check, but I'll bet the poppies will be blooming soon, and in force. I'll have a full report about April 11. A nice post, and a beautiful spot/drive. I worked in support of CALTRANS in 2007 as we had deployed a slope monitoring radar ...after the slide event. I pent a few weeks driving to the site each day and to Stockton with a USB key of data. I do hope they will use radar (IBIS-FM) to monitor the slide area while the removal and anchor drilling process is underway. There is a rockshed on Colorado route 550 south of Ouray..as site that has seen fatalities and numerous slides -- but is an amazing drive too.